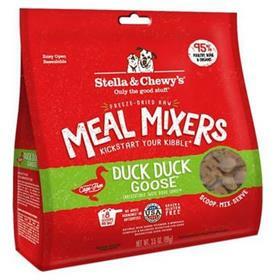 Kickstart your canine’s kibble with Stella & Chewy’s Duck Duck Goose Meal Mixers Grain-Free Freeze-Dried Dog Food! Even the pickiest pups find it hard to resist the hand-crafted taste of this meal mixer. One simple scoop is all it takes to turn everyday kibble into awesome raw nutrition! It’s an easy way to pack your pooch’s diet with nutrients, probiotics and antioxidants. Best of all it’s made from 95% cage-free poultry, organs and bone that has been finely grounded, so your pal can safely get the nutrition she needs. Plus, this meal mixer also contains real organic fruits and vegetables! Each small batch is made with care in Stella & Chewy’s USA-based kitchen and offers the benefits of raw food nutrition with the convenience of freeze-dried preparation! Ingredients: Duck With Ground Bone, Turkey, Turkey Liver, Goose, Turkey Gizzard, Pumpkin Seed, Organic Cranberries, Organic Spinach, Organic Broccoli, Organic Beets, Organic Carrots, Organic Squash, Organic Blueberries, Fenugreek Seed, Potassium Chloride, Dried Kelp, Sodium Phosphate, Tocopherols (Preservative), Choline Chloride, Dried Pediococcus Acidilactici Fermentation Product, Dried Lactobacillus Acidophilus Fermentation Product, Dried Bifidobacterium Longum Fermentation Product, Dried Bacillus Coagulans Fermentation Product, Zinc Proteinate, Iron Proteinate, Taurine, Calcium Carbonate, Vitamin E Supplement, Thiamine Mononitrate, Copper Proteinate, Manganese Proteinate, Sodium Selenite, Niacin Supplement, D-Calcium Pantothenate, Riboflavin Supplement, Vitamin A Supplement, Vitamin D3 Supplement, Vitamin B12 Supplement, Pyridoxine Hydrochloride, Folic Acid.